All the features that made the Oceanis 38 an award-winner are present in this boat, but in a more compact package and at a lower price. 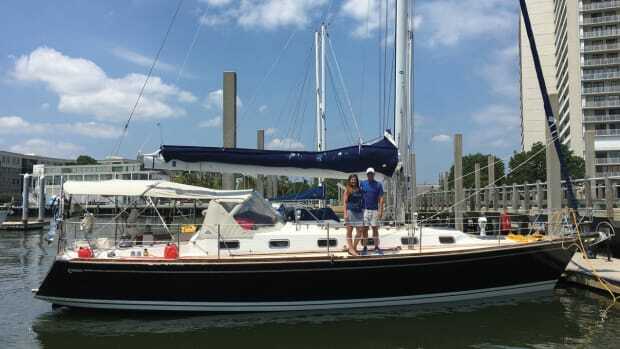 It’s a great starter boat for young couples or young families who want a boat that can evolve as they do. Beneteau’s groundbreaking Oceanis 38, which featured a dramatic new approach to accommodation space in a cruising monohull, scored a host of awards during its 2013-14 debut season, including a Best Boats nod from SAIL. 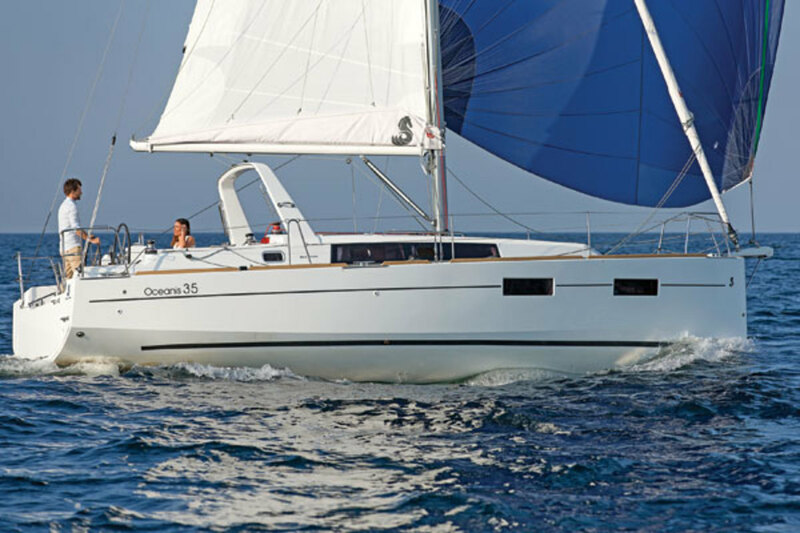 Now comes a slightly smaller sibling, the new Oceanis 35, with the same sort of flexible modular interior. The new 35’s build regimen is identical to that of its larger sibling. Its hull is solid fiberglass laminate set in polyester resin. The injection-molded deck is cored with Saerfoam, and is screwed and bonded to the hull. 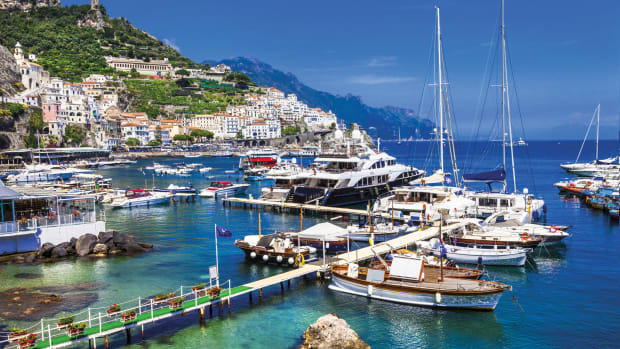 Where more traditional boats rely on fixed interior bulkheads and furniture to help stiffen their hulls, most of the interior support on these open-plan boats comes from a large solid-laminate structural hull liner that is bonded in place. The beamy, hard-chined hull can be ordered with a deep T-shaped keel, with a shoal-draft L-shaped keel, or with a centerboard housed in a keel/trunk below the hull. As with many European cruisers, ballast is iron. The rudderstocks (one for each of the two rudders) are stainless steel.  The cockpit on the Oceanis 35 follows the current trend in modern boats, with twin helms and a fold-down transom that allows immediate access to the water. To further improve access, there are fold-up helm seats on both sides that can flipped out of the way when desired. A unique feature that has become de rigeur on Beneteaus of late is a cockpit arch forward, to which the mainsail is sheeted, with a bridle rather than a traveler. The cockpit is very wide, so I was happy to see a fixed table with folding leaves to brace against while sailing. I was also impressed by the amount of storage space. There are two large lazarettes aft, and our test boat, which had only one aft cabin, also had a truly enormous locker space under the starboard cockpit seat. All control lines are led aft, with most, including the mainsheet, coming to two banks of Spinlock clutches on either side of the companionway that are serviced by a pair of Harken winches. The only lines you can reach from the helm stations are the jib sheets, which are led to two Harken winches on the cockpit coamings. 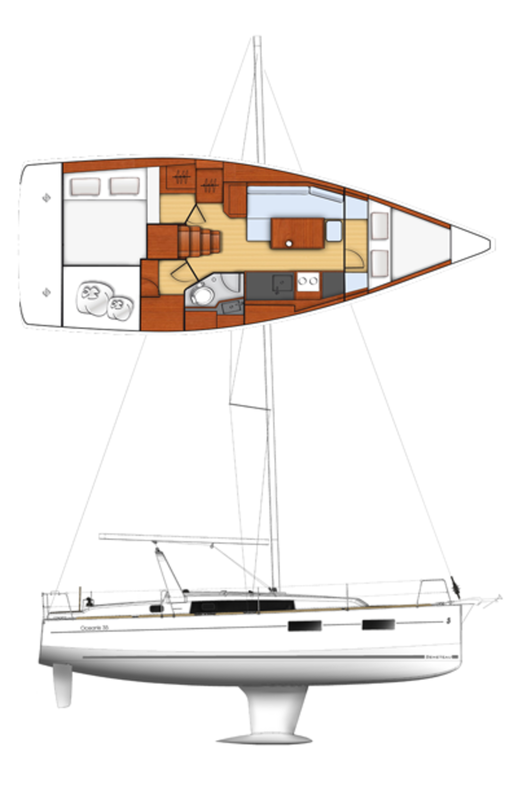 Like the Oceanis 38, the 35 has five different layout plans, with three different designations—Daysailer, Weekender and Cruiser. All three plans feature tremendous amounts of open space from the companionway forward to the bow, with removable forward bulkheads available in the four different Weekender and Cruiser plans. Various modular furniture components can also be added as upgrades during the boat’s service life. The most popular layout on the 38, by far, has proven to be the Cruiser, which, tellingly, is the only one that includes a proper stove. 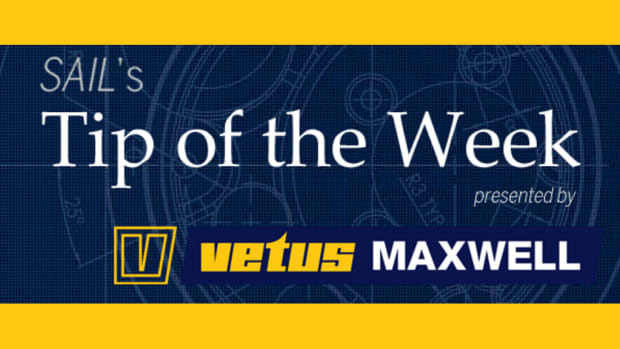 I expect this trend will continue, as the 35 builds its own sales records. Our test boat featured the “two cabin” version of the Cruiser layout (shown above), which really only has one segregated stateroom (aft), unless you install the removable bulkhead to close off the forward double berth into another stateroom, which apparently most buyers don’t do. Be that as it may, the aft stateroom on our test boat was fabulous, with a large, very comfortable athwartship double berth, good vertical clearance, and more cross ventilation than you could ever hope to find in an aft cabin on a monohull less than 50ft in length. The head was also very impressive, with two segregated compartments—one for the toilet and sink, and another for the shower, side by side, aft to starboard. 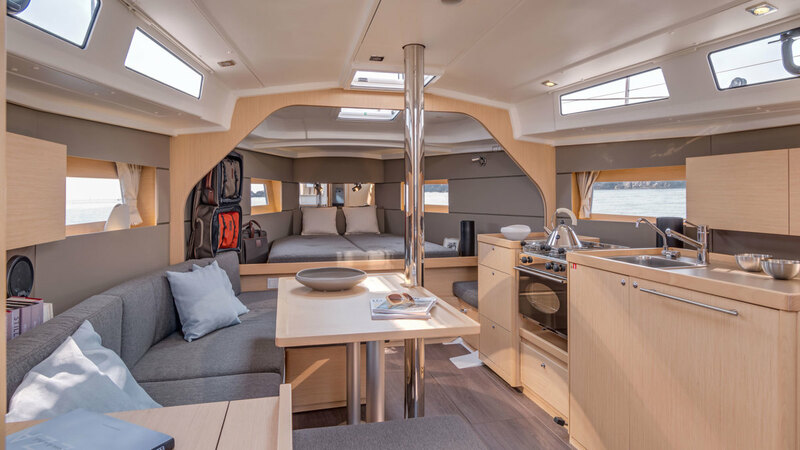 The open space forward of the companionway is delightful, light and airy, finished in tasteful blonde oak, with a long settee to port and an elegant, yet minimalist in-line galley featuring a Reichsman stove and Vitrifrigo fridge to starboard. The only significant difference I see between this space on the 35 and the 38 is that the open double berth forward on the 38 is much larger and more square than on the 35. If you plan to stick a pair of small children in the forward berth while enjoying the more private, more palatial aft berth with your spouse (as I suspect many will), this may not really matter to you. One final note: none of these are really seagoing interiors, as is reflected in their bare-minimum electrical systems and fuel- and water-tank capacities. 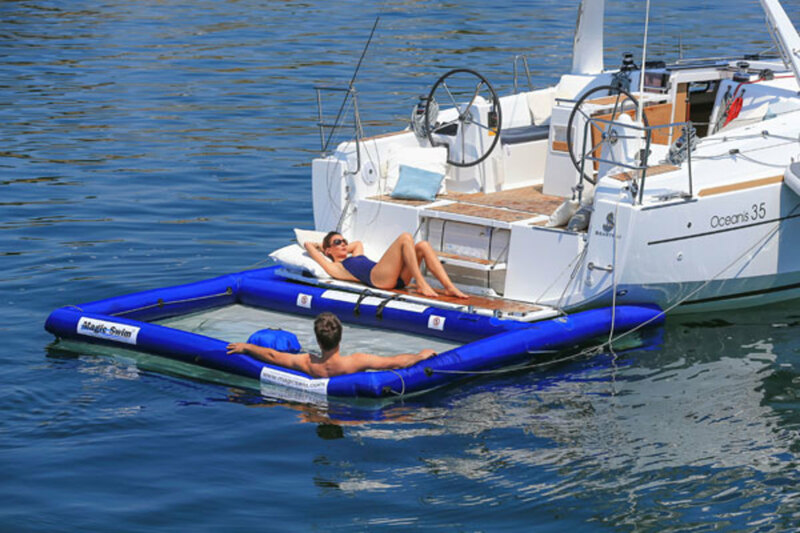 These boats are intended for coastal cruising, and the various interiors, which have few handholds, work best when stationary or in moderate conditions. The boat has a 9/10ths Sparcraft fractional rig designed to fly a modest jib with a wee bit of overlap. 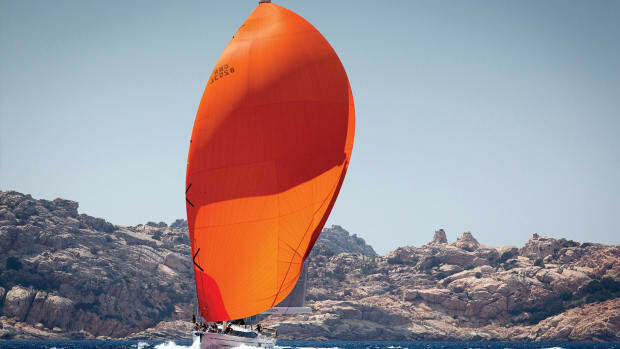 A larger Code-Zero-type headsail or an asymmetric spinnaker can be flown from the beefy bowsprit/anchor-roller up forward. Our test boat, with a shoal-draft keel, had an ElvstrÖm in-mast furling mainsail and an ElvstrÖm jib controlled by a Facnor roller-furler. As sometimes happens when test-sailing brand-new boats, I found the rig on our boat had just been put up and wasn’t properly tuned. 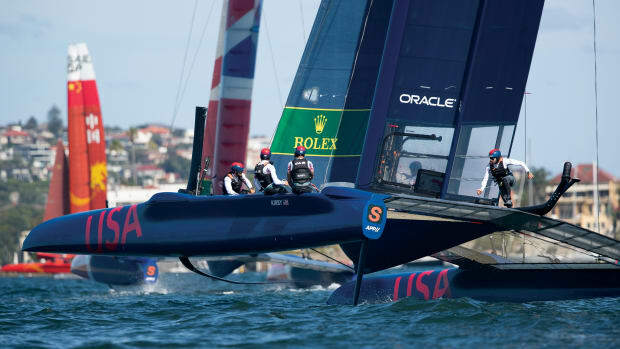 Still, our sailing performance seemed creditable. 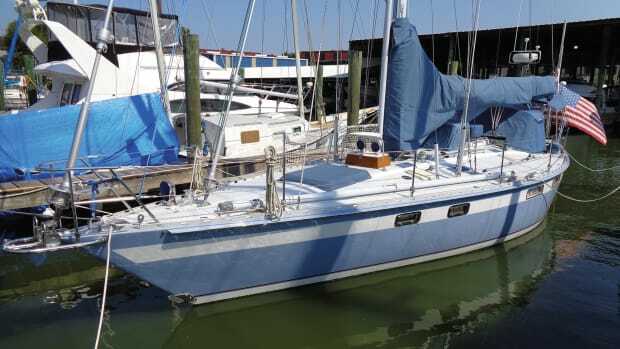 Sailing on Chesapeake Bay in 15-20 knots of true wind with apparent gusts to 35, we hit a top speed of 7 knots sailing on a close reach to a beam reach with a partially furled mainsail. We maintained 6.8 knots with the boat closehauled at a 40-degree apparent wind angle, and when we pinched to 35 degrees our speed dropped to 5.4 knots. On a broad reach under working sails with the full main out, we made 5.4 knots. The helm was extremely stable, thanks to the twin rudders, with a wide groove. Taking my hands off the wheel, I found the boat tracked on course for some time before rounding up. Thanks also to the pronounced hull chine, form stability was excellent, and even in the robust conditions we experienced, heeling was moderate. Our boat was equipped with the optional 30hp Yanmar diesel auxiliary with a fixed prop, as opposed to the standard 20hp mill, and we were happy to have it. Motoring straight into 18 knots of breeze and a moderate chop, we made 7 knots with the throttle maxed out at 3,800 rpm. At 2,700 rpm we made 5.4 knots, and at a moderate cruise setting of 2,400 rpm this dropped to 4.3 knots. Spinning donuts, I could turn the boat right around in one boatlength. Backing down I had no trouble holding the boat’s bow to the wind once we got moving, and control otherwise was good. All the features that made the Oceanis 38 an award-winner are present in this boat, but in a more compact package and at a lower price. It’s a great starter boat for young couples or young families who want a boat that can evolve as they do. 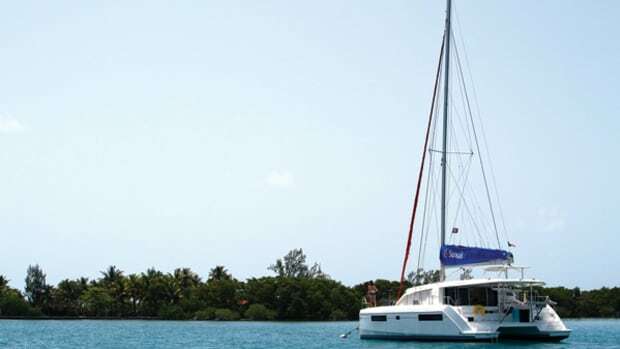 It should also appeal to more experienced sailors who want an easy-to-handle moderate-sized coastal cruiser that maximizes comfort and livability at anchor.